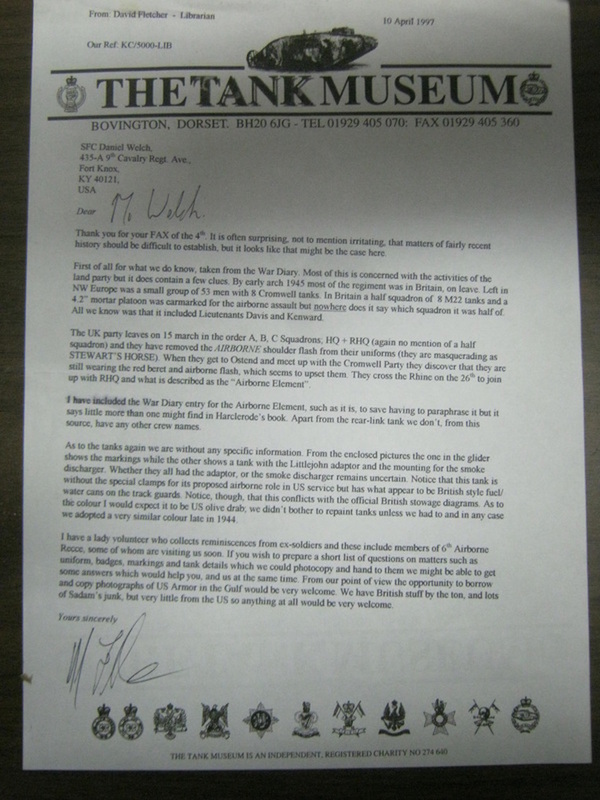 I put together the questionaire and sent it to Davaid, and a few weeks later, I started receiveing letters from veterans of the regiment, as well as a couple of very unexpected phone calls from veterans of the regiment from the UK and Australia. 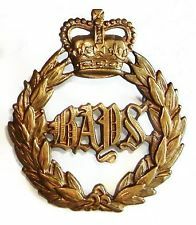 To my surprise, Cpl Darlington wore his Royal Tank Regiment Cap badge from his time with the 47th RTR in the TA, along with his RTR patch on his sleeve, his "Special Boat Service" shoulder title from his time in that unit before it became the Light Tank Squadron, his Pegasus patch (which was the one item that one would expect to be there), and paratroopers jump wings even though he was in an airlanding unit. Although his case is pretty extreme, the other vets told similar stories. I asked him just to be sure what he sent me was what he was actually wearing, not just items from his service, and he assured me that those patches are what he was wearing on his sleeve throughout his time. The vets used the terms 'clannish' and 'tribal' to describe the members of the regiment in their attitudes, and that they had all volunteered to join the regiment from some other unit. 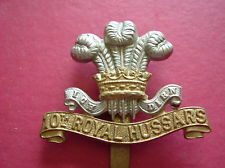 Hussars, dragoons, bays, etc., and they all tended to wear their cap badge from their previous unit. I had assumed they would be wearing either the Royal Armoured Corps badge, or the Reconnaissance Corps Badge. I was told that none of the tankers wore the reconnaissance badge, and the members of the regiment they remembered who did wear it weren't on tanks. 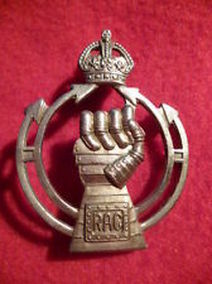 When tankers wore the Royal Armoured Corps badge, they were usually replacements who had not come from a previous regiment, but had come from the training units straight into the 6th AARR. There was even an unofficial cap badge that was specific to the regiment, designed by a member of the regiment and worn by some members who made them on their own. Shoulder titles generally were either the Light Tank Squadron title or the Royal Armoured Corps title, never the Reconnaissance shoulder title. Cpl Darlington's case of keeping his Special Boat Service title throughout the war, even by the regiment's standards, is unusual. Although the airborne maroon beret was supposed to be the standard, crews swapped back and forth from their maroon berets to their black berets. 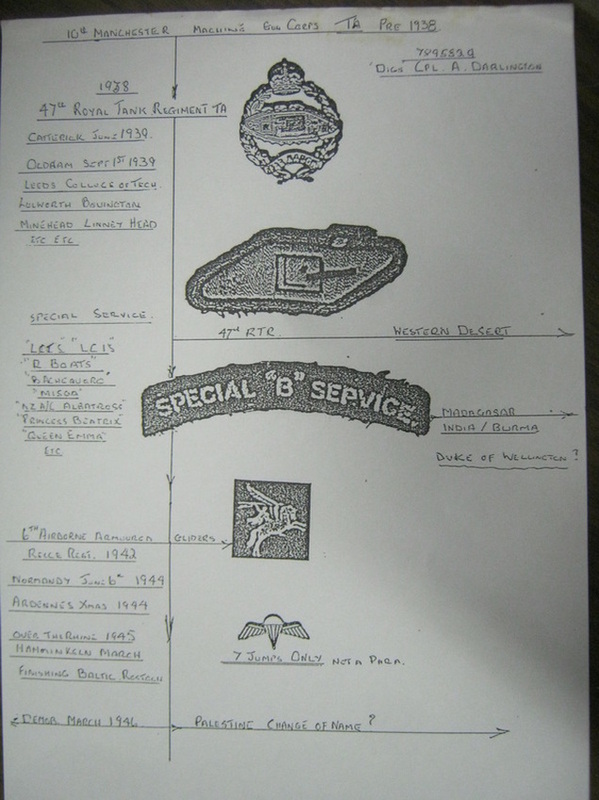 There is one account of when the regiment deployed to the continent to reinforce the 21st Army Group during the Battle of the Bulge, where the regiment was ordered to take off their airborne insignia and wear their black berets, so that spies couldn't identify them as from the 6th Airborne. Upon arrival, linking up with members already there, they discovered the members of the regiment already in Belgium had not gotten the word and were still wearing their maroon berets. In general, what you could expect to see a member of the tank troops wearing would be the maroon or black beret with his tribal cap badge from the old days, the unofficial 6th AARR badge,or a RAC badge for a young replacement from the RAC depots. Sleeve insignia would be Light Tank Squadron or Royal Armoured Corps shoulder title. 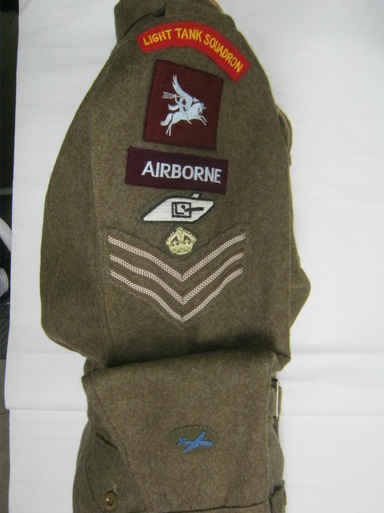 Normally the sleeve would also have the pegasus patch, an airborne strip below it, and a glider patch on the lower sleeve for glider qualified troops, which they all were after their training was complete. The Royal Tank Regiment rhomboid tank patch would be worn by members who had come from one of the battalions of the Royal Tank Regiment. And finally, the appropriate rank insignia, and any specialist patches that had been awarded, such as bren gunners and mortarmen and whatnot. Members of the recce troops (carrier and dingo crews and the assault troops) would generally wear the Reconnaissance Corps cap badge with Reconnaissance Corps shoulder titles, with the rest of the sleeve being the same as for the tank troops. In contrast to Corporal Darlington above, to the left is something a bit more typical for the regiment. This sleeve is set up for a Staff Sergeant of the Light Tank Squadron. 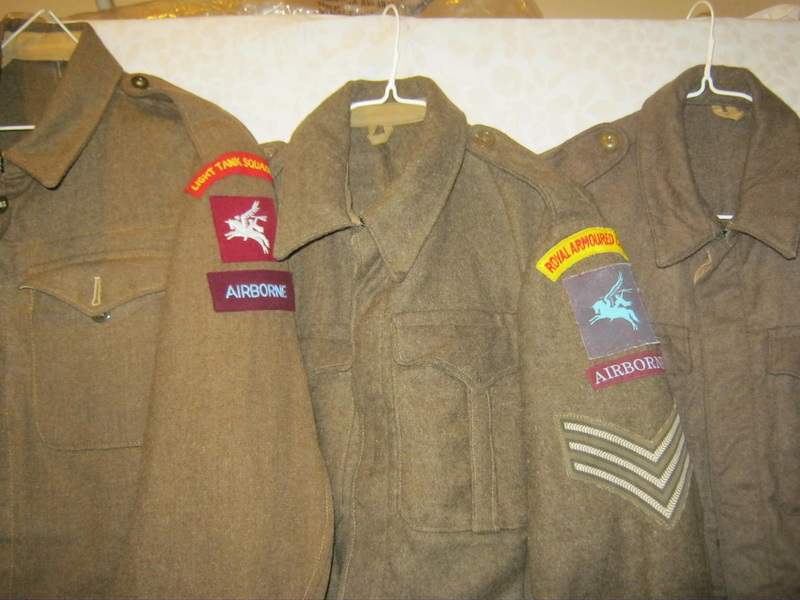 The shoulder title is at the top, below that the Pegasus patch worn by all members of the airborne divisions, with the Airborne strip below that. The WW1 tank is the patch worn by all members of the Royal Tank Regiment, and it's presence on this blouse signifies that the soldier was a volunteer from one of the battalions of the Royal Tank Regiment. His rank is denoted by the crown above the three chevrons as a Staff Sergeant. 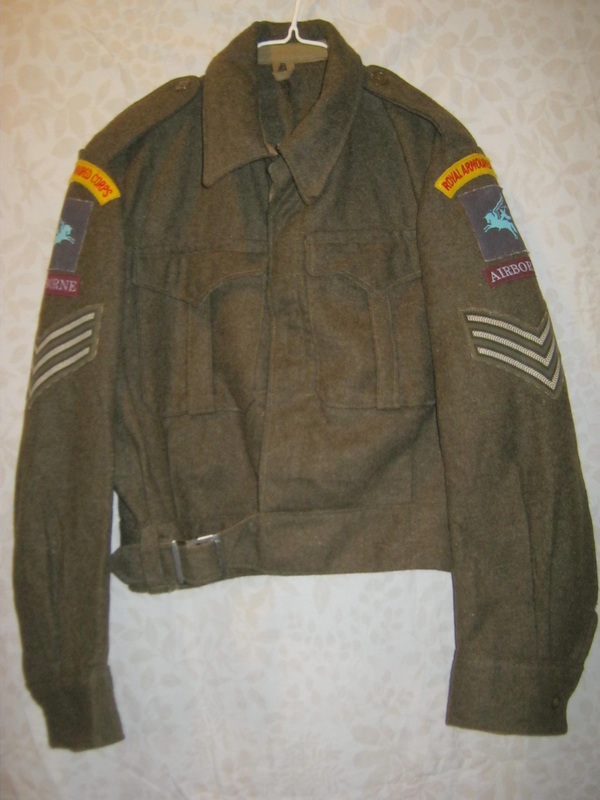 The sleeve is doubled up a bit to show the glider patch, worn by all qualified air-landing troops, those delivered by glider and not by parachute. To the left is the second version cap badge of the Royal Armoured Corps. In its final form, the 6th AARR was officially a part of the Royal Armoured Corps, after transforming from the Special Boat Squadron through the Light Tank Sqadron to ultimately the 6th Airborne Armoured Reconnaisance Regiment, Royal Armoured Corps. Below are shown the cap badges of the primary regiments who contributed volunteers to the Special Boat Squadron and Airborne Tank Squadron. Troopers from other units also joined, but it is not known (to me anyway) what tribes they were from. Ultimately, replacements due to battle losses were drawn from the Royal Armoured Corps training depots. 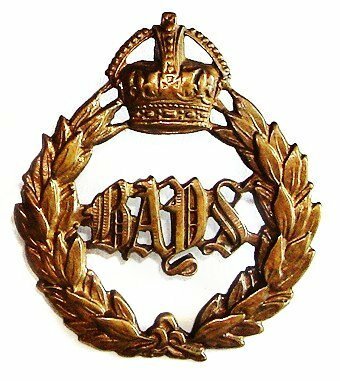 It should be noted that anyone doing research or desiring to collect these, or other WW2 British cap badges, should make sure the badge they are looking at has the "King's Crown" and not the "Queens Crown". The British forces wear badges with the proper crown for whomever is in power, be it the king, or the queen. At the time of WW2, King George VI reigned, so the King's Crown is proper for WW2. To clarify, compare the crown on the badge to the left with the badge above it. The badge to the left is a post-war badge, worn currently for the reigning monarch, Qeen Elizabeth II. The badge above it is a WW2 era badge, worn during the reign of King George VI. The above badges, from left to right, are The Queens Bays (2nd Dragoon Guards), 9th Queens Royal Lancers, 10th Royal Hussars (Prince of Wales' Own), 13th/18th Royal Hussars (Queen Mary's Own), and the Royal Tank Regiment. There were many battalions of the Royal Tank Regiment, and they were numbered 1RTR, 2RTR, etc. So if a soldier came from 4RTR, that means he was a volunteer from the 4th Battalion, Royal Tank Regiment. It would be common to see the old-hand tankers of the 6th AARR wearing any of these badges at any given time. Above are all three versions of the Royal Armoured Corps cap badge. Left, 1939-1941. Center 1941-1953. Right 1953-1955. Prototype design that was rejected as the official badge, but was worn by some members of the regiment. Benouville Pegasus bridge museum. 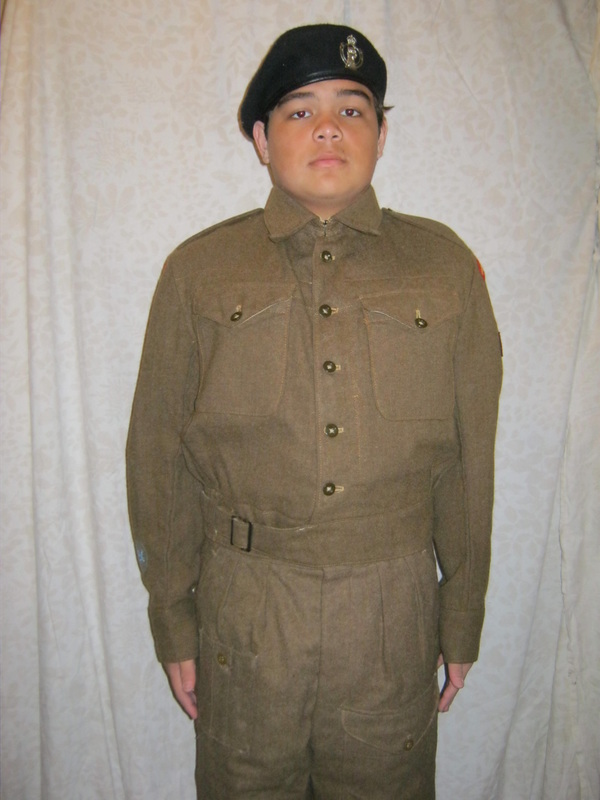 The cap badge was worn by Sgt Jeremy H. Barkway, 6th airborne armoured reconnaissance regiment. From the looks of it it is a custom made item using a RAC and para cap badge cut in half and mounted on a piece of perspex. Also note it's a maroon beret and not black. The above photo was taken between the 6th AARR's return from Germany and Deployment to Palestine. 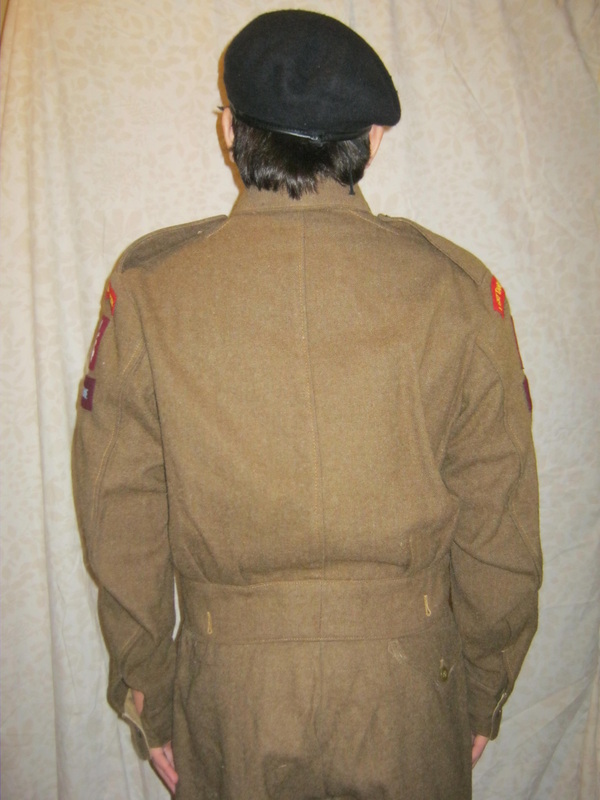 Note the variety of cap badges and sleeve insignia. Also note, from the shade of gray, the maroon beret is being worn. Notice in contrast with the above photo: the difference in black and white photos between the maroon berets and the black berets being worn by members of the 6th AARR in this photo. Also note, that they are definitely tankers, as the berets are black, only worn by armored personnel, and the driver's cap badge can be determined NOT to be a paratroopers badge from the shape, yet these men are wearing dennison smocks like other members of the division while working with their tanks. Other photos show them wearing tank coveralls, and sometimes battle dress with neither smocks nor coveralls. Regarding clothing, the men were issued with the new Royal Armoured Corps Tank Suits (also known as "pixie suits") in December of 1944, and they wore them in action during the Battle of the Bulge. To the left is the cap badge of the Reconnaissance Corps. The Reconnaissance Corps came into being in January 1941. When the Light Tank Squadron was expanded to become a regiment, reconnaissance troops were added equipped with universal carriers and Daimler Dingos. 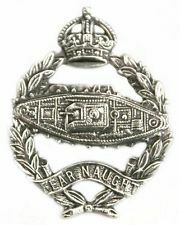 Although the tankers, who had formed a definite unique personality as a group by this point, were loath to wear the Reconnaissance Corps badge (or the Royal Armoured Corps badge, for that matter), the "recce" troops were not. This would be the common badge worn by the "recce's". Contrary to popular belief, it is not modelled on a Christmas Tree. 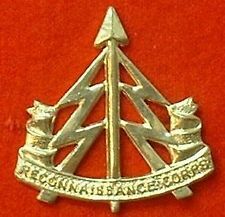 The badge consists of a central upward pointing spear, franed to left and right by upward pointing lightning bolts, with the title ribbon "Reconnaissance Corps" framing the central motifs. To the left is a soldier in the most basic of basics, his undergarments. 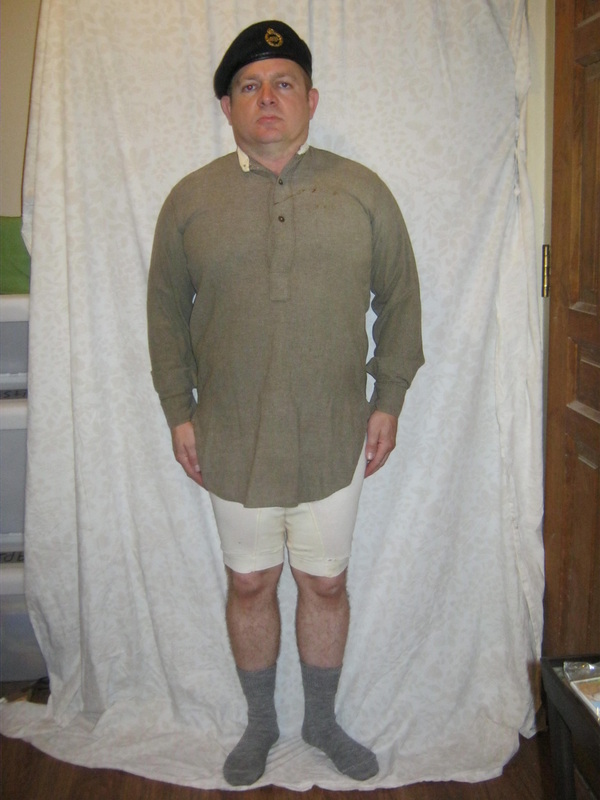 The collarless undershirt is an original wartime undershirt, He is wearing boxer shorts of wartime pattern, and grey wool socks which are of the standard for issue. To the left is a close up photo of the underwear worn by the soldier above. I decided to spare you the photo of the close up actually being worn by the soldier above. Note the button fly overlapping and offset to the right, and the string ties to adjust the waist band on the left and right hip. It is a stretch material, conforming to the soldier. To the right is another pattern, more like boxer shorts. The material is more like a terri cloth with small holes woven into the fabric for the skin to breath. 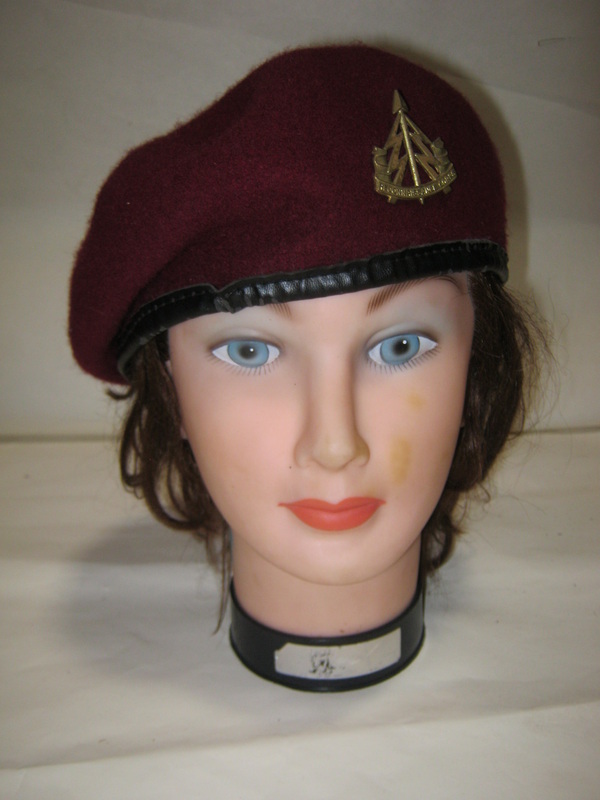 To the left is the maroon beret for airborne soldiers. The cap badge is that of the Reconnaissance Regiment. To the right the the black beret for armoured soldiers. 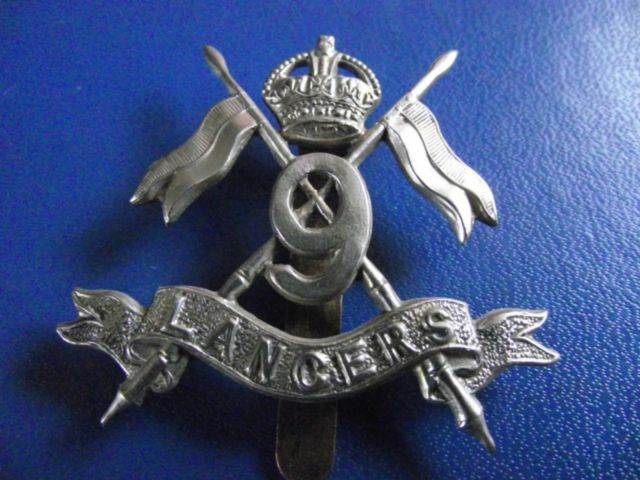 The cap badge is that of the 9th Lancers, one of the regiments that volunteers for the Tank Squadron came from. To left and right is a soldier wearing the P40 Battle Dress, or "BD" uniform of tunic and trousers. 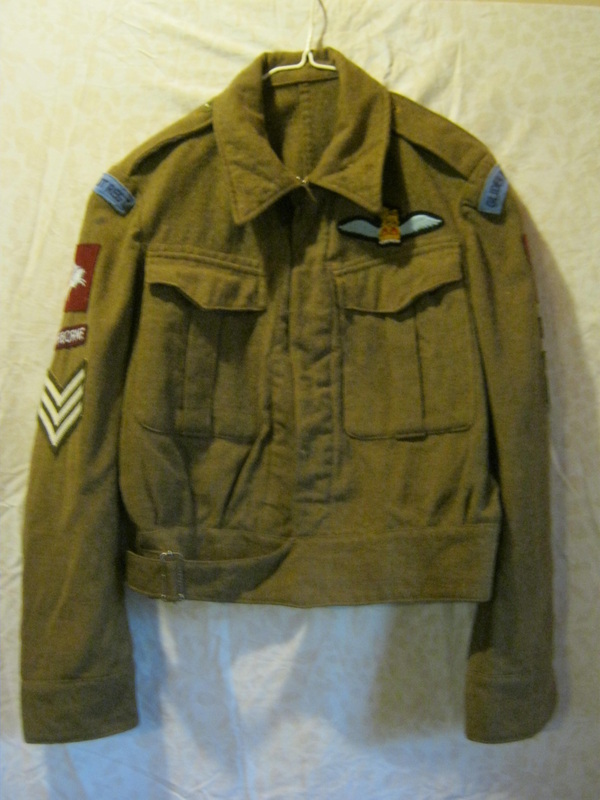 The P40 BD was a modification of the pre-war P37 Battle Dress uniform. The changes were to speed production and reduce the amount of material needed to manufacture the uniform, for war-time economy, and are described below. The visible differences between the two were that the P37 had pleated pockets and hidden buttons, where-as the P40 had unpleated pockets and visibile buttons. Note the pleats on the pockets and the hidden buttons. 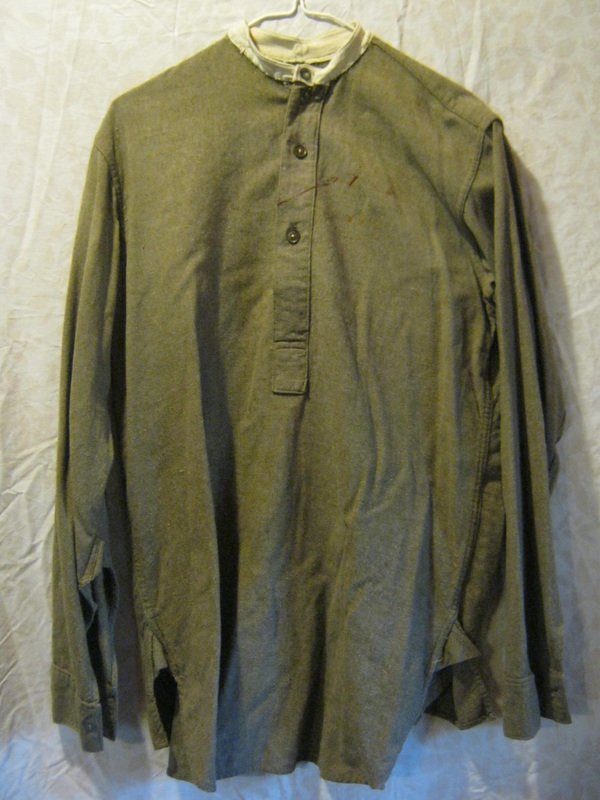 This tunic is that of a glider pilot. 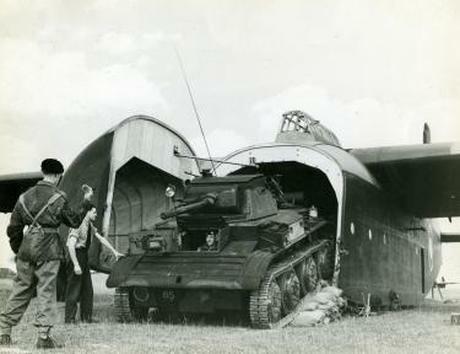 Glider pilots were trained to fight alongside the soldiers they delivered into battle after landing the glider. To the right is an orginal P40 BD tunic. The insignia is a mix of original and reproduction. 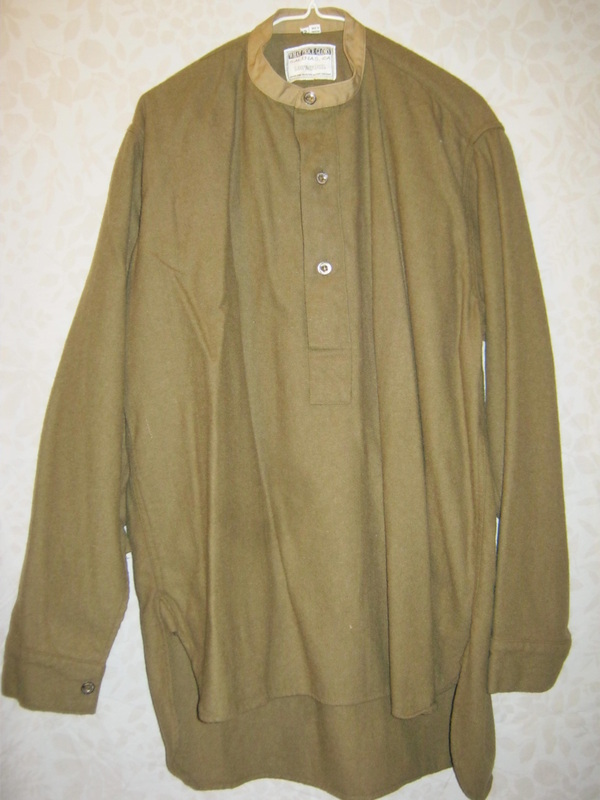 This tunic is that of a soldier belonging to the Light Tank Squadron. Note the unpleated pockets, and the exposed buttons. The sewn button holes are clearly visible on the unbuttoned chest pockets. To the left is a reproduction P40 BD tunic, made by "King and Country" who is no longer in business, although reproductions can still be bought from What Price Glory, reached at www.onlinemilitaria.net . 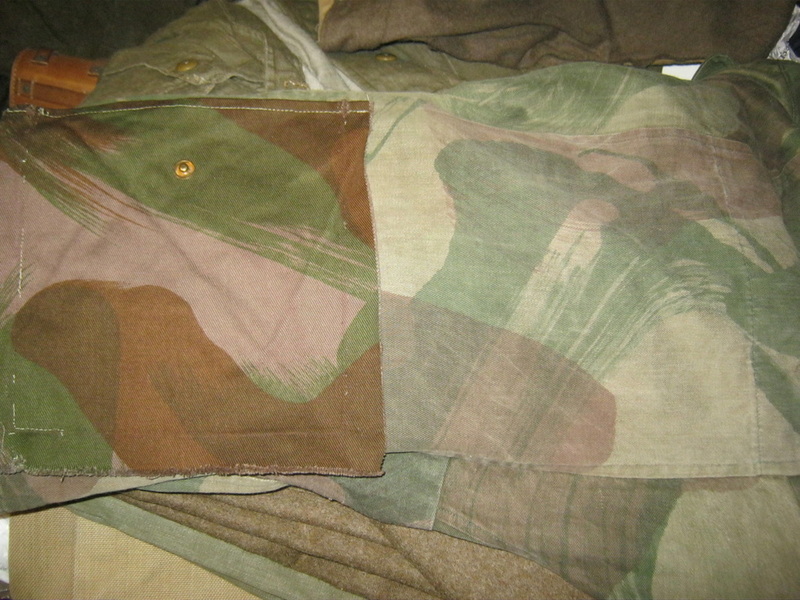 To the right is a P37 pattern BD tunic of a sergeant in the 6th AARR. 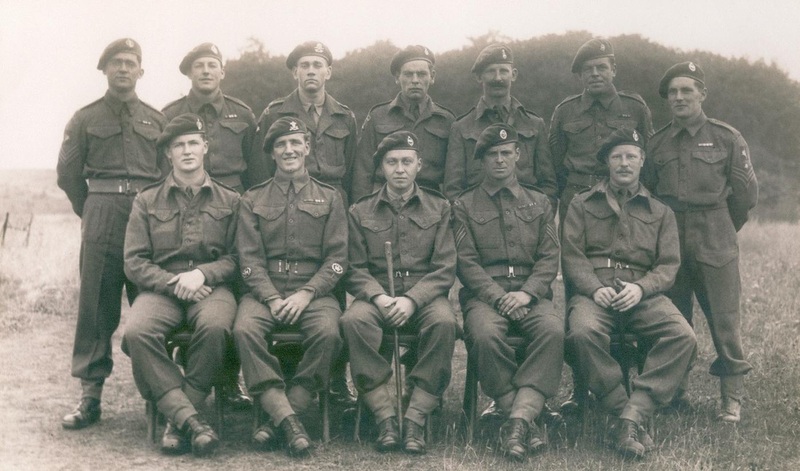 When the 6th AARR became a part of the Royal Armoured Corps (within the 6th Airborne Division) in the Spring off 1944, it would become common to see soldiers wearing the RAC shoulder titles. 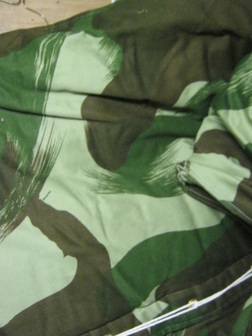 This particular BD blouse is of post-war Greek manufacture, as the Greek Army adopted british pattern BD as its uniform. To the left are three BD blouses, the left original, the middle greek, and the right greek. Note the difference in shade from brown to brown-green, to green. Above is the left-most blouse compared side-to-side with the right most blouse. 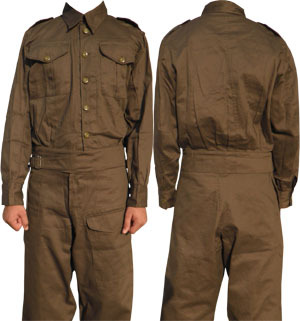 If you find a greek uniform cheap, MAKE SURE it is closer to brown than green. 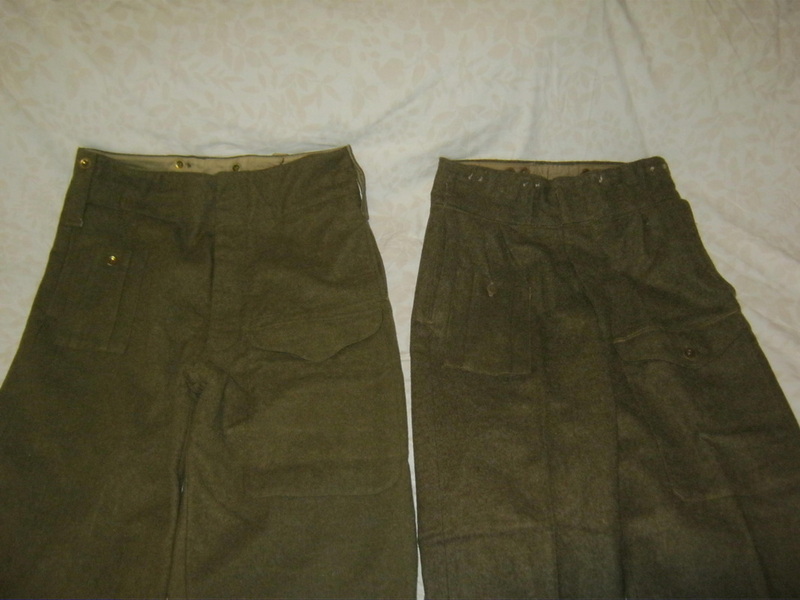 To the left are a reproduction pair of BD trousers on the far left, and to the near left is a pair of P49 BD trousers, converted to match the WW2 pattern. The post war pattern P49 BD was very similar to WW2. The trousers are easy to convert, but because the cut of the lapels is totally different, P49 blouses are not, and would require a near total reworking of the bodice. 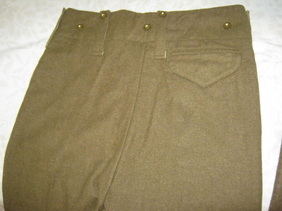 P49 trousers can often be found very cheap on Ebay, often for $20 or less. A conversion of the P49 to P40 standards is detailed here. 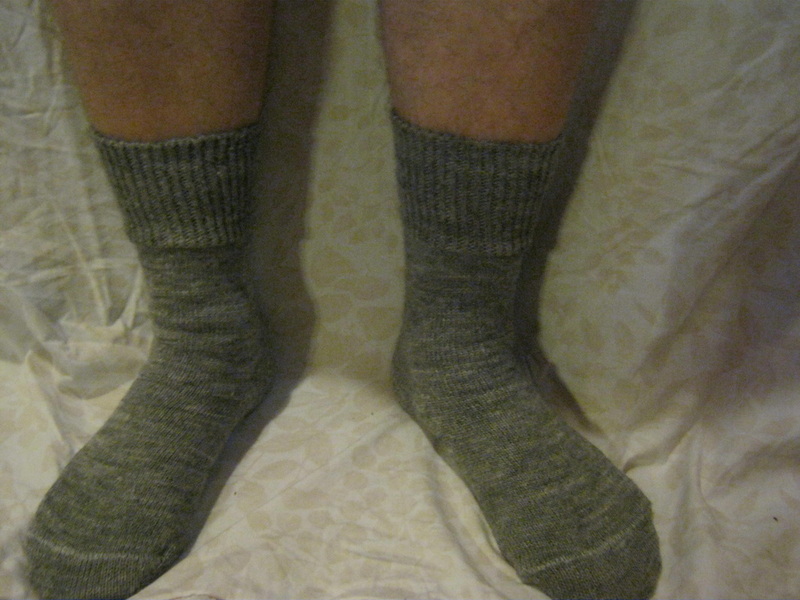 The pocket that is seen on the left leg front has been moved from the left side leg and resewn on the front of the leg. 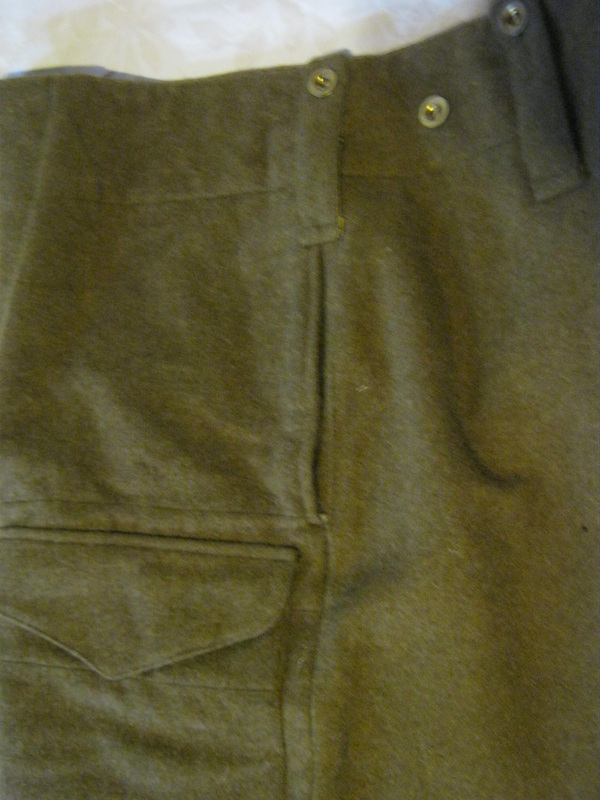 The pleated small pocket on the right upper is for first aid dressings. This is made from material taken from the leg bottom if the trousers are very long, or from a second pair of trousers scrapped for the cloth. There is a small belt tab with a hook at the top of the fly that is removed. To the left is the detail of the repro trouser side. 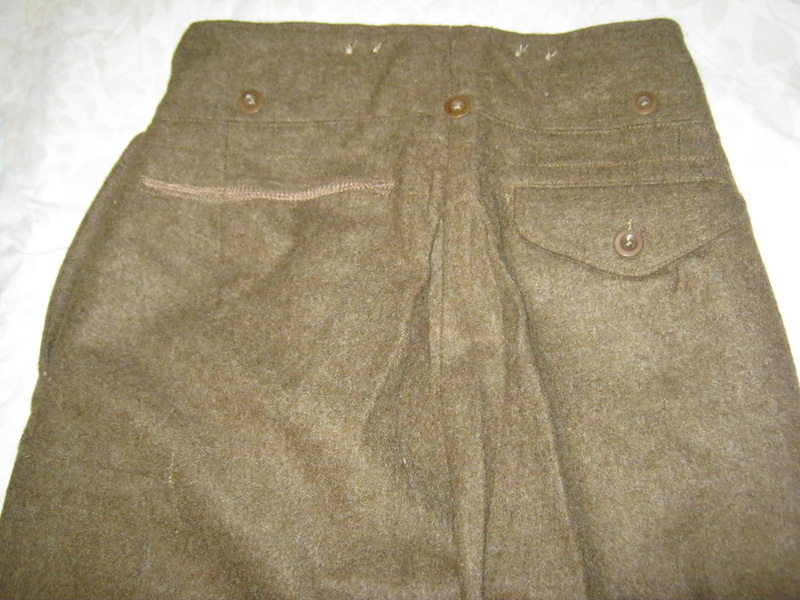 The belt loops in later war trousers were omitted as being un-necessary, as the trousers were held up with braces (suspenders) and not a belt. The P49 at right comes with similar belt loops, but facing down with the button at the bottom. 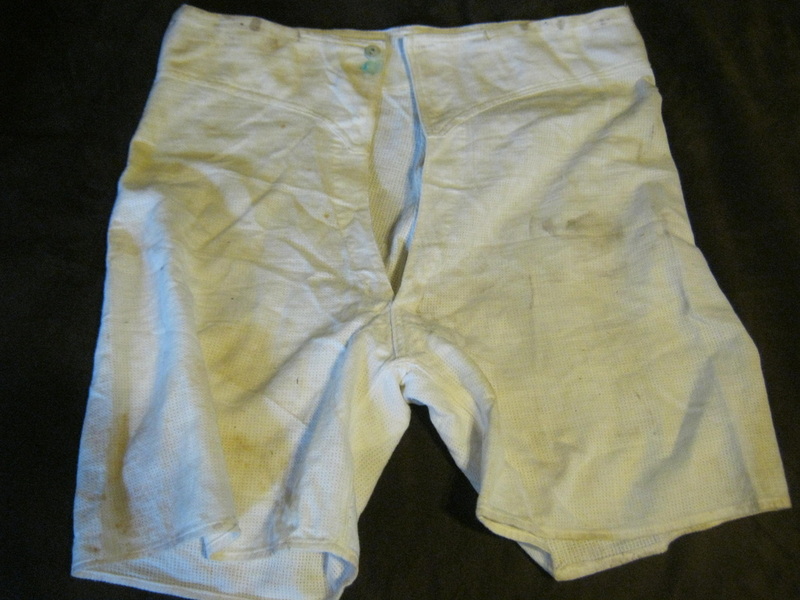 Since the late war trousers didn't have them, just remove them. Keep the buttons for spares. The pocket is angled on the P49, so the waist band seam is split and the pleats let out, to resew the pocket straigh up the leg with the seam. If you look closely on the photo to the right, you can barely see where the leg pocket originally was sewn to the side. This is where the only really noticeable difference of the conversion lies. To the left, you can see there is no pocket on the left rear buttock. On the converted P49 to the right, there were two, and the left was removed and the slit darned shut. Fortunately, this scar is not noticeable most of the time under the blouse or smock. Note that in the photo of the back of the soldier above, he is wearing this exact pair of trousers to the right. To the left and right are a denim BD overall blouse. 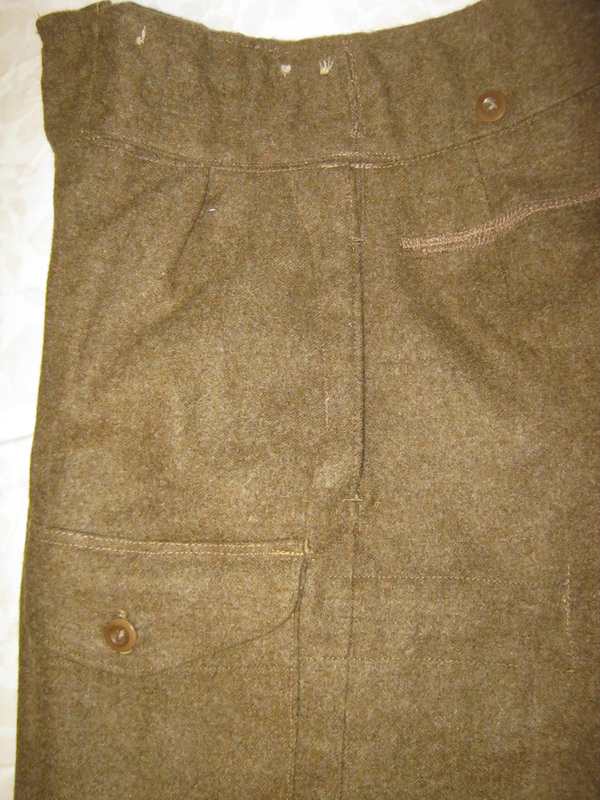 The same pattern as the wool BD, as were the overall trousers, but made of denim. 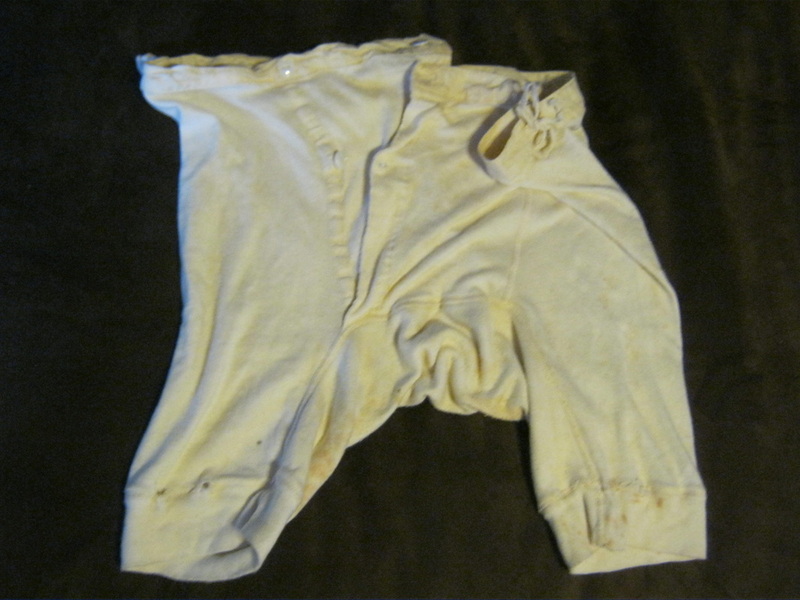 The overalls were to be worn over the wool BD to keep them clean and serviceable, or for warmth in cold weather. The BD overalls could also be worn alone in certain climates, such as jungle or desert. 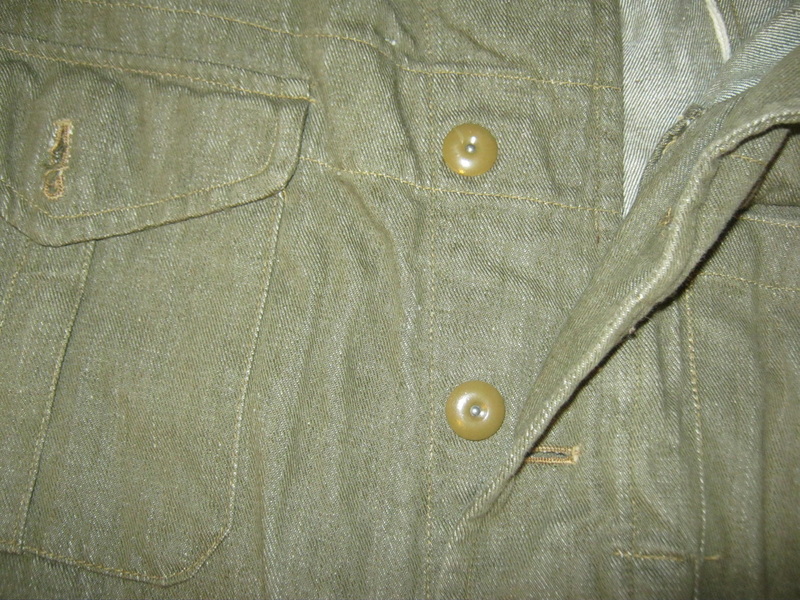 Note the wartime economy pattern buttons in the detail photo at right, as well as the denim fabric itself. The British airborne forces wore low boots called "ammo boots" Below are photos of the details of an original pair of ammo boots. Any low ankle boot with a leather sole and cap toe is sufficient. If it looks like the boots below, it's good. What Price Glory stocks repro ammo boots for a competitive price to similar boots that are not ammo boots, so you want to take that into account when looking for boots. HOWEVER, boots with steel plates on the heels and toes make movement on armored vehicles hazardous, as you tend to slide with the metal on metal contact. 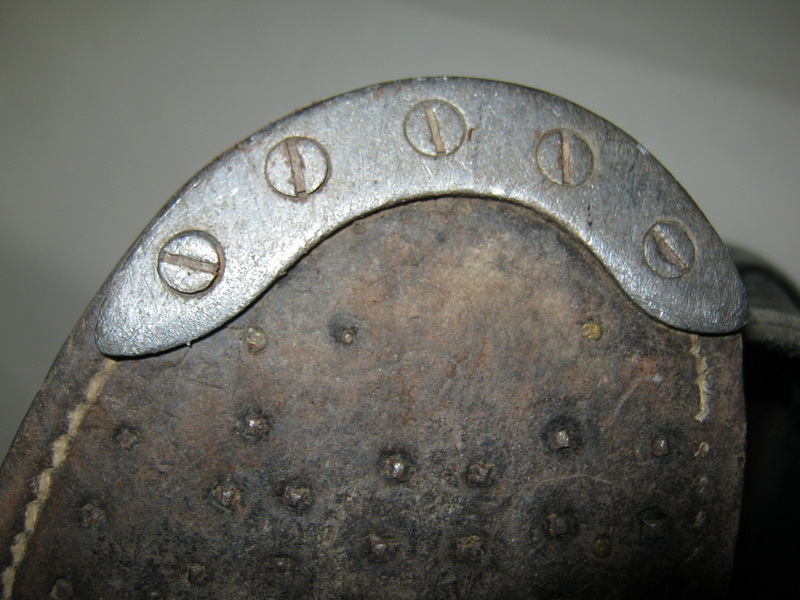 Steel heel and toe plates also scrape the paint, which can begin the process of rust on antique vehicles, and damage components such as glass faced gauges and whatnot when climbing in and out of vehicles. 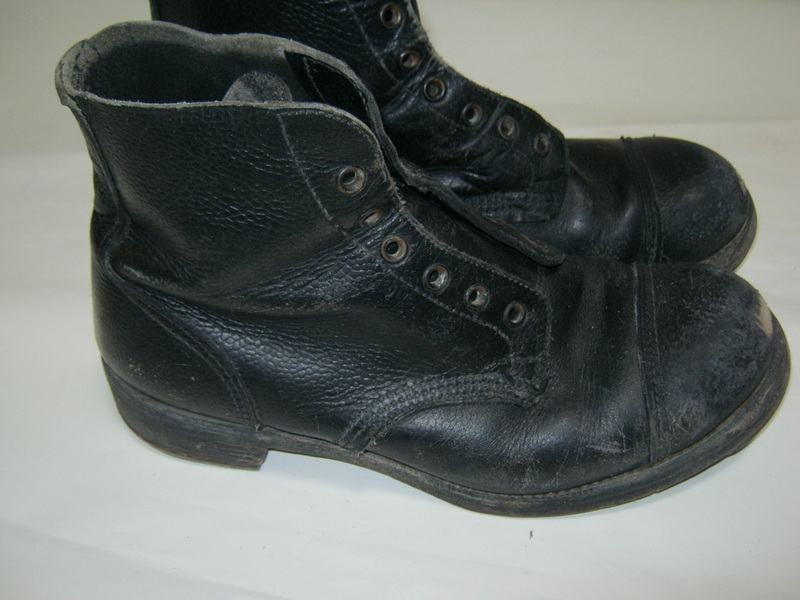 For this reason, club members are required to have regular ammo boots re-soled with rubber and the toe and heel plates removed, or buy a pair of cap-toed black leather lace up boots with rubber soles that resemble british ammo boots. Ammo boot laces were rawhide laces, readily available wherever shoe and boot laces are sold. The photo of a para in full gear to the left was borrowed from the 1st Airborne Division Living History Association. The photo of the helmet above is from IMA's website. 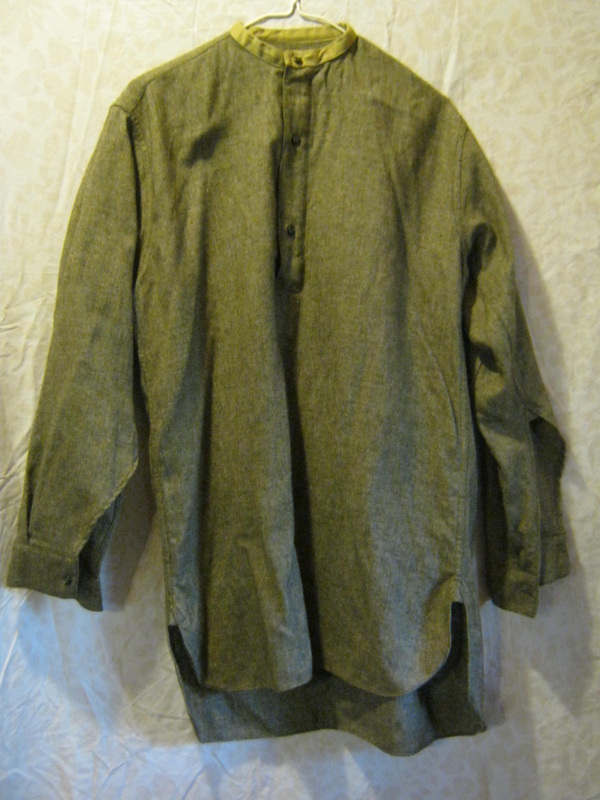 A strategy to get the best setup would be to get the package deal from onlinemilitaria.net, sell the smock for $100.00 on ebay, and then use the $100 toward the purchase of one of Military Tour's first pattern smocks. Or, you can take your time, save some money, and look for deals on used uniforms and gear, convert items from post war or other armies to conform to wartime british standards, etc. One of the best places to look for good deals is ebay. There are many uniforms and gear dealers on the internet. Go search! At left is the WPG Denisson Smock. The material is quite brite. 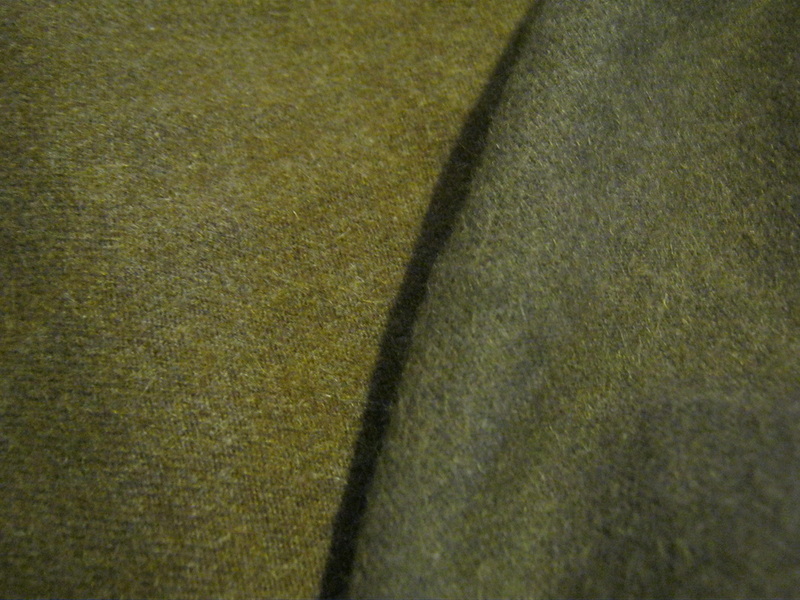 At right is a sample of the WPG material to the left of the photo aftery dyeing, laid over original material. One bottle of Rit Dye cocoa brown, agitate for 20 minutes minimum, followed by one bottle of Rit Dye dark green, agitate for 30 minutes minimum, will improve the color drastically. This sample was soaked for 30 in cocoa brown and 20 in dark green. Reverse it as instructed above and yours will match original better than the test material pictured at right. Putting together a uniform and gear for an armoured vehicle crewman is not quite as simple as getting a package deal with almost everything you need in one purchase. The tank, carrier, or scout car crews had the basic P37 Battledress Uniform like everyone else. Photos show armoured crews sometimes wearing Dennison smocks. 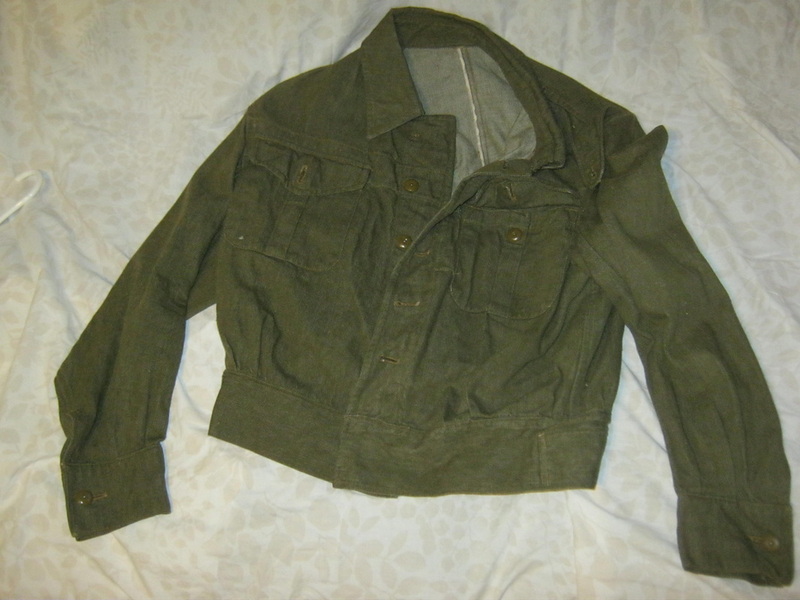 They also wore denim tank coveralls, and in the winter of 44 through the rest of the war, the RAC tank suits (nicknamed "Pixie Suits" and "Zoot Suits"). The RAC tank helmet was issued to the crews, which looks similar to the airborne helmet, but has a different liner and chin strap. Crews wore the standard pistol belt, but were issued with revolvers, automatic pistols, sten guns or rifles depending on the type of vehicle they were on, and depending on their job. If they had a handgun, they were issued with a special holster for armoured vehicle crews. There was an early version with a long strap with the holster worn low on the thigh, and a later version with the holster worn close to the hip. If the crewman's personal weapon were a sten or enfield, they'd be issued with the appropriate webbing for that weapon. Although crews were issued with web packs and water bottles, they wouldn't be attached to their web harness in the manner of the infantry. Water bottles would be stowed in the vehicle, packs stowed inside or on the outside of the vehicle, etc. Until December 1944, normally on campaign the crews would be wearing battledress or denim tank coveralls. 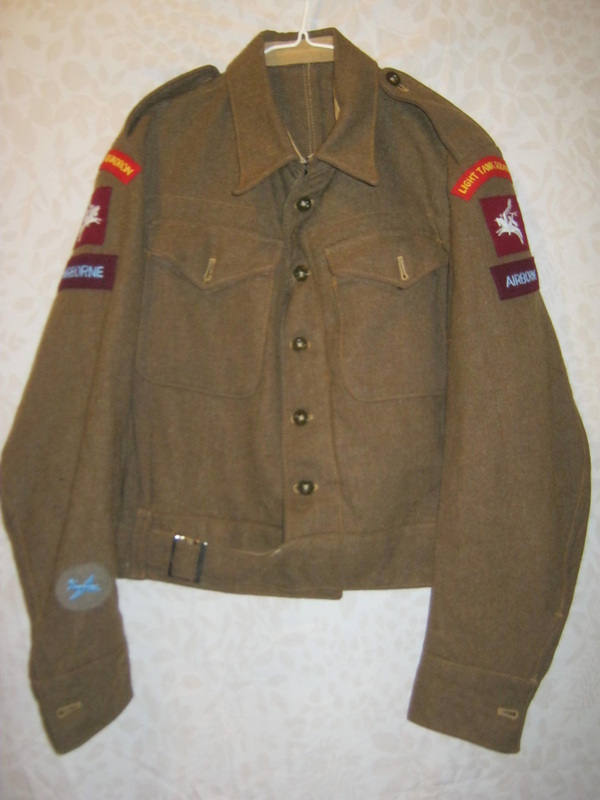 During December 1944, when the regiment was sent to Belgium, they were issued with the RAC Tank Suit, which was worn regularly all the way to the end of the war in May 1945. Currently, here is no regular source for obtaining the RAC tank suit or the denim tank coveralls. They can be found on occasion from various sources on the internet, such as collectable militaria dealers and Ebay. 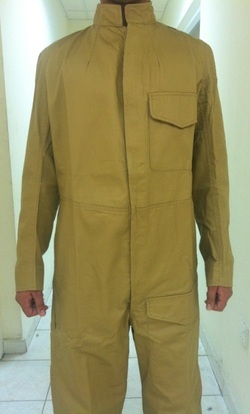 The price for a RAC Tank Suit depends on the size, condition, and country of the seller. Generally, they can be had for between $100.00 and $200.00. Notwithstanding what position you hold on which vehicle, as a crew member, a typical setup would require a set of battledress, or battle dress trousers and denison smock, or tank coveralls or RAC tank suit, with a pistol belt, holster, ammo pouch and cross braces for basic webbing. Black beret with badge and RAC helmet for headgear, and ammo boots for foot gear, with leggings if you are wearing battledress trousers. Water bottle with carrier and pack would be needed, and stowed on the vehicle. AS A MINIMUM, to get started as an armour crew member in our club, you need a pair of denim battle dress (since the denim tank coveralls are not available), a pair of ammo boots, and a black beret with cap badge. All three can be had by using the link buttons below. 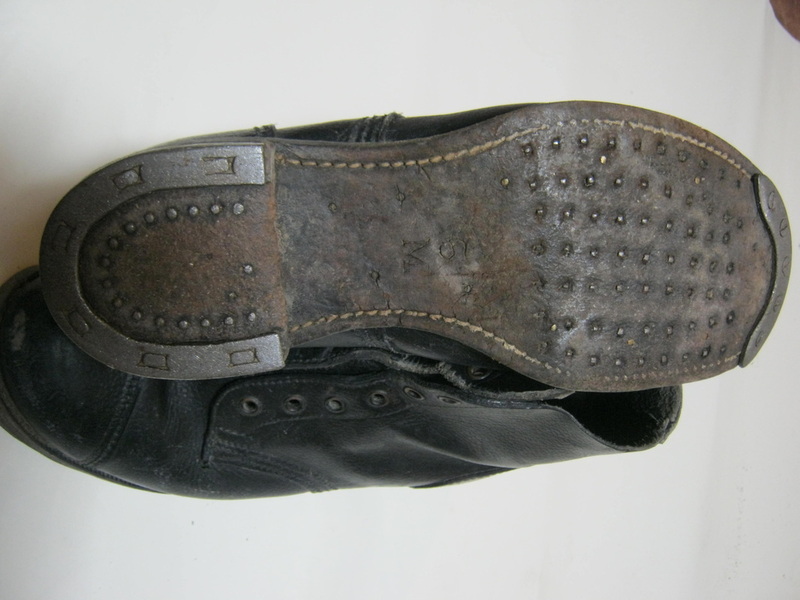 A requirement of the club is that the soles of the boots must be rubber, and not leather with steel plates, because they are extremely slippery on the steel vehicles and can cause injury to the person and damage to the antique vehicles. 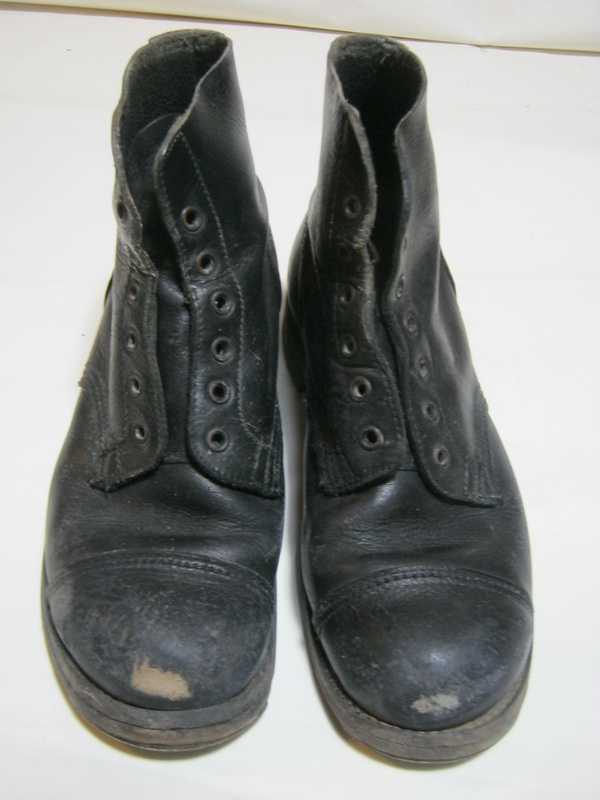 The boots can be re-soled with rubber by any typical boot repair shop. To the left is the "What Price Glory" set of denim battledress, currently $90.00 if you buy the jacket and trousers together as a set. Along with a pair of their ammo boots, re-soled with rubber by your local boot repair shop, and a black beret with cap badge, is what you need as the minimum to get started as an armoured vehicle crew member in our club. Click the link below to order a set of their denim battle dress, and on the same website you will find also black berets and ammo boots. 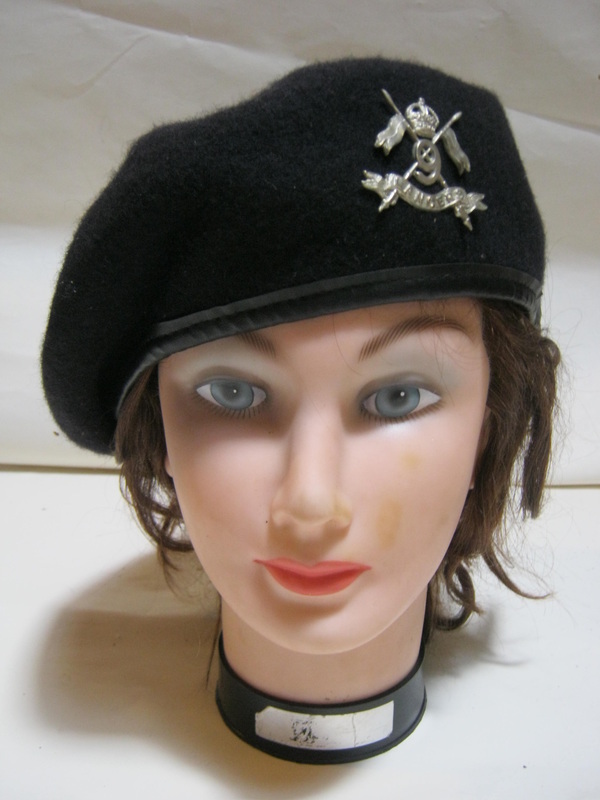 To order a black beret from "What Price Glory", click the button below. To order a pair of "What Price Glory" ammo boots with toe caps, click the button below. Another option to begin your armoured vehicle crew impression are What Price Glory's newly listed Khaki Drill Tanker Overalls. These are similar to the cotton tanker overalls that were used in Northwest Europe, but were designed for use in the Mediterranean Theater. But since we have to make due with what we can get, these are acceptable. The quality of construction is excellent, and they have the proper pockets, including the First Aid Dressing pocket on the rear hip, the slits in the sides of the hips so you can get to your trouser pockets underneath, and the open vent slots in the armpits to assist in cooling the trooper. 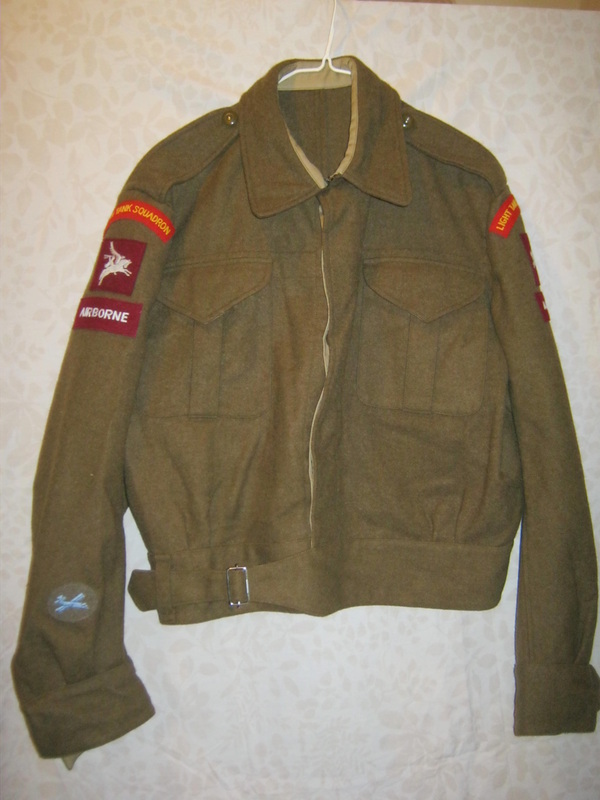 Link to Collecting British WW2 airborne militaria website. Link to 6th June 1944 . com website. Source for cap badges, shoulder titles (including Light Tank Squadron and Reconnaissance Corp), rank insignia, airborne patches, etc.